Part of my Design Team duties is to create a few cards a month as “inspiration” for all of you. I have to say that I am completely stressed over this requirement, but so far, the team leader indicates I am on track. With that said, here is my first inspirational card for 2018! It is so nice NOT to be making Christmas cards! I sent out over 100 hand-made cards this year–and then had to buy some to mail at the last minute. 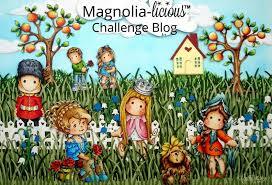 This adorable image is Gelato Tilda, which can be found in the Magnolia-licious store (and on sale!). She is from the summer 2017 collection. The base paper of the card is from My Favorite Things called Ripe Raspberry Prestige…it is gorgeous! Their paper is thick and durable and ideal for cards. And the colors…they are to die for! Check out their web site and what they have to offer–I am slowly trying to collect the paper. The layered patterned paper is from a water color background pad from Hobby Lobby (I used the same pad for the card on the “Splish Splash” post); the embellishments are from my stash (yeah, finally using them! ); and she is colored with Copic markers. There are times that I look at an image and I know immediately what I am going to make. Then there are times that I fret over the colors and paper (this happens more often). When I saw this adorable Tilda, I knew she had to be pink and coordinating the paper was pretty easy. I have been leaving my cards “blank” regarding the event. This way, I can add a “happy birthday” tag to this card, stamp a birthday saying inside, and voile, I have a birthday card. This is the easiest solution for me because you never know what you are going to need a card for. As we get settled in to a new year, I hope you are motivated and enjoying your craft. Do not get discouraged. I have the best support system from a group of ladies who crop together in town every month. Find a group, either in person or online, who shares your interests. They will be your strongest supporters. ← Join our First Challenge in 2018! Hi Karen, Wanted to tell you how much I like your card :o) Beautifully made. Tilda is coloured wonderfully and I love all of the additions to your card ( pins, pearls, lace etc. ) Great job and many thanks.